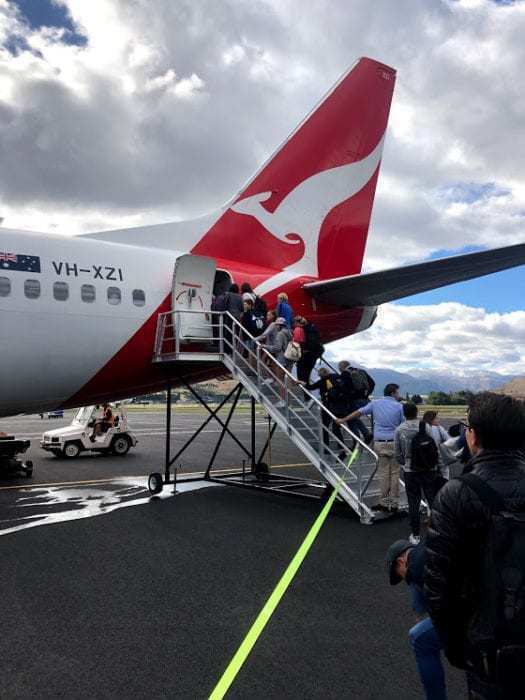 In stark contrast to my excellent business class flight on LATAM’s fifth freedom route to Auckland, I thought that it would be great to try the Qantas equivalent price point: Economy on their short-haul international configured Boeing 737-800. Naturally, this is not really ‘comparable’ in the sense that the later is Economy and the former is Business, but as they cost around the same price it should factor into your consideration. 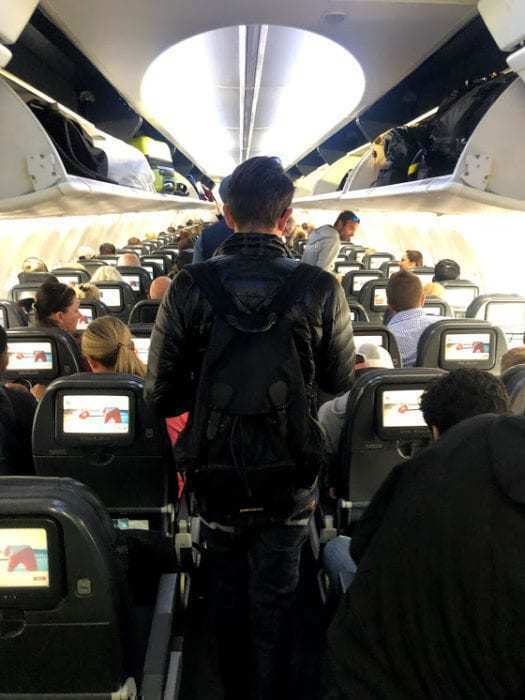 Qantas is currently overhauling their short-haul fleet, and it can be a gamble whether you get the more generous legroom newer seats with entertainment screens and free wifi or their older planes that really put the squeeze on the knees. 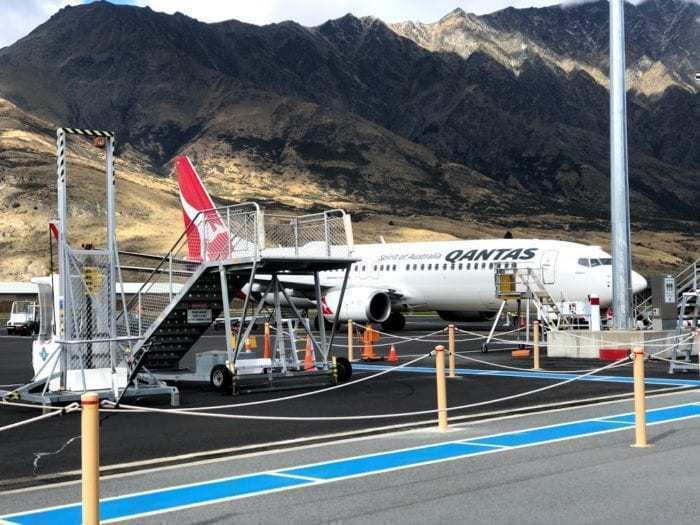 Queenstown airport is small; very small. The international area only has one duty-free shop that also doubles as the cafe. There is a Qantas lounge and Virgin Australia lounge but, as economy passengers, we did not have access. The aircraft was late by approximately 30 minutes, and we had to let the other passengers from Australia off first. We then boarded via the front and rear stars. Sitting in row 23, we boarded from the back. It was actually quite fast when we got out onto the tarmac, and there was plenty of room in the overhead bins for my bag. Qantas allows one checked item per passenger, which means there was no real need for large bulky bags onboard. Lucky for us, we were onboard one of the renovated 737-800s, and thus had all the new features. 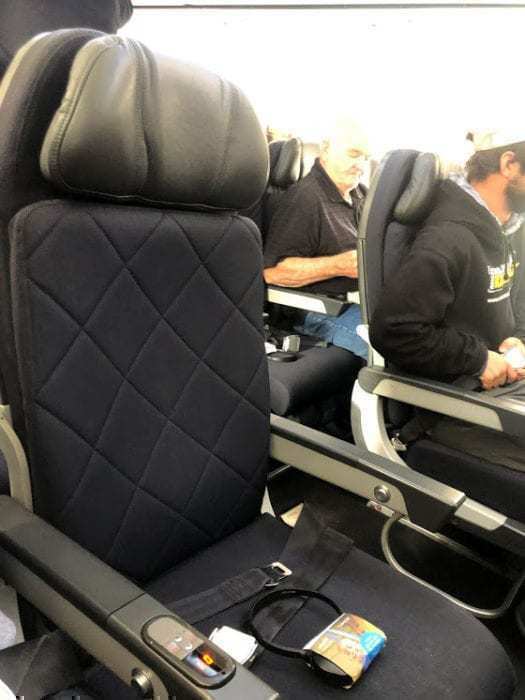 The quilting was very similar to the new upcoming British Airways business class suite, which makes us wonder if BA was inspired by fellow Oneworld airline Qantas. 30 inches of legroom, and a width of 17.2 inches. There is an entertainment screen and a USB power port in the seat. The tray table is solid and quite generous. The seat reclines but with the legroom as it was, I did not want to test my rear fellow passengers patience. The flight back to Sydney from Queenstown is approximately three and a half hours. It routes entirely over the ocean, so after takeoff (which was spectacular), it was rather uneventful. I attempted to watch a movie on the plane, but the film was not suited for the tiny screen (9 inches) with too many fast cuts. 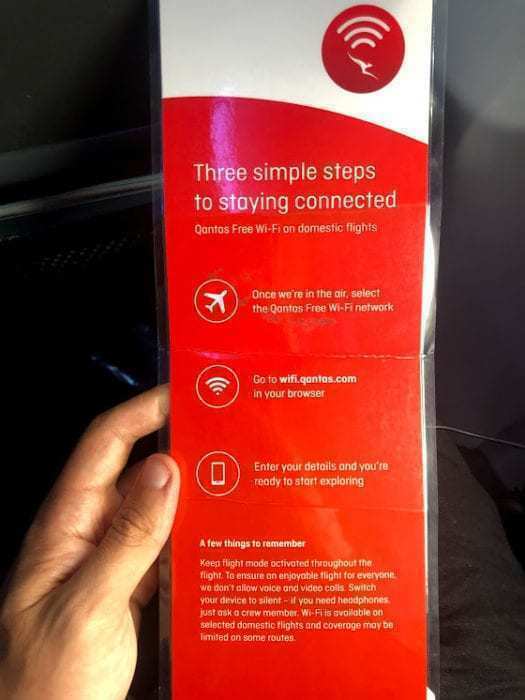 Qantas says that they now have wifi onboard, but apparently it doesn’t apply to international flights. You would think that the fact that the aircraft has the wifi information card proves that this plane is normally routed on domestic routes. But a quick look at Google Flights shows that Qantas normally uses a domestic plane on the international route. Halfway through the flight, we were given three options for dinner; pasta, chicken or beef. I attempted to order the pasta, but for whatever reason I received the beef. However, it was delicious and was given two garlic bread rolls (which was a nice alternative to having to butter my own bread). They then gave me an ice lolly for dessert, which melted in the packet and proceed to turn my pants into half cotton, half chocolate. I do miss the younger years of flying Qantas and getting more substantial food, with a salad, dessert and more. This downgrade over the years has made me look fondly at other carriers. We then landed in Sydney and the ride was over. 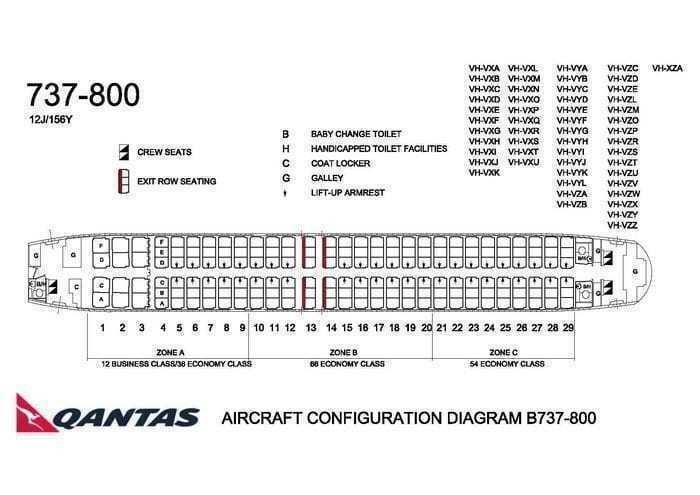 Qantas operates a competitive product to other economy flights on the Australia to New Zealand route. 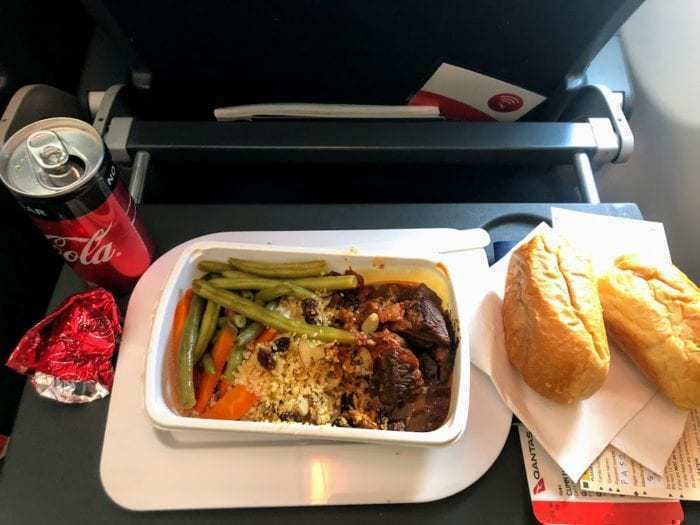 The fact that you get a meal, baggage and entertainment does make it a superior option to low-cost carriers (such as Jetstar). However, with Virgin Australia now offering the same perks to New Zealand, it remains to be seen if Qantas can stay the top dog. Let us know in the comments below what you think!